Adelaide kept a third consecutive clean sheet in a tight win. Josep Gombau made one change from last week’s 0-0 draw with Perth, bringing Cirio back into the side in place of Cameron Watson, with Jeronimo Neumann moving to the right. Gary van Egmond lost Kew Jailiens to his troublesome hamstring, meaning Josh Mitchell got a rare start. James Brown was dropped in favour of the returning Nathan Burns, and Emile Heskey was on the bench. 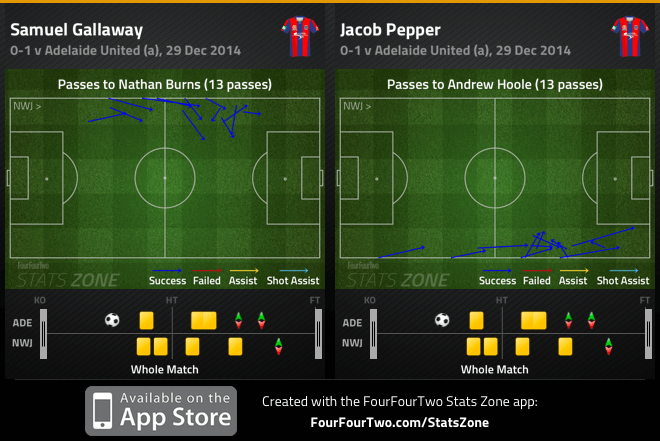 Adelaide had the better opportunities throughout as Newcastle struggled to build meaningful attacks. Gombau exaggerated the point in his pre-match interview, but the gist of what he was saying was fairly accurate – Adelaide were going to dominate possession against a Jets side that would play predominantly on the counter-attack, looking to break things up in the central zone with their energetic, combative midfield trio. Last week’s 2-0 win over Brisbane was illustrative, as Newcastle sat deep, soaked up Brisbane’s pressure, then broke quickly through the front three. Interestingly, though, Van Egmond opted to slightly alter the format of his midfield trio, pushing Josh Brillante into a more advanced role. It wasn’t quite 4-2-3-1, more still the 4-3-3 that has been Newcastle’s default since the fourth round of the season, but Brillante was in between a no.10 and no.8 position, moving close to Adam Taggart to help press from the front. Presumably, Van Egmond wanted his side to play more proactively without the ball than they had against Brisbane, something he hinted at on Friday in his comments to the media. Newcastle were more positive without the ball here, closing down higher up the pitch here and looking to disrupt Adelaide’s now-default passing out from the back. Brillante was particularly keen to close down Isaias, as if to prevent the Spanish midfielder from getting time on the ball and dictating the tempo of the match. While Isaias finished as the game’s highest passer, the actual quality and quantity of his passing dipped, which is why Van Egmond’s midfield tactics can be described as partly successful – because broadly speaking, there was less creativity from the Adelaide midfielders, with Marcelo Carrusca in particular forced out into very wide positions. However, Adelaide still had good passing from deep positions from their two centre-backs, with Jon McKain stepping forward to hit some tidy balls over the top, and Newcastle neglected to deal with this additional threat. Furthermore, Adelaide have introduced more variety into their game in recent weeks. Eugene Galekovic is far more willing to go long, with the return of Bruce Djite into the side giving Adelaide a physical target high up the pitch. As mentioned here, it doesn’t mean Gombau’s sacrificing his possession-based game (although they are averaging less in recent weeks compared to the start of the season) but adding another dimension to the game, particularly because Djite’s physicality means he can hold the ball up and help retain possession. Adelaide created a few chances here by simply bypassing the Jets initial press and playing quickly through Djite, with Jeronimo coming close after the former laid the ball down neatly just outside the penalty area. However, Adelaide (who deserved their half-time lead on the balance of play) looked most promising when playing through Cirio. They repeatedly made incursions through the left-winger, via a number of sources – sometimes hitting the ball in behind for him to chase, other times hitting long, accurate diagonals so he could dribble directly at Newcastle’s defence. 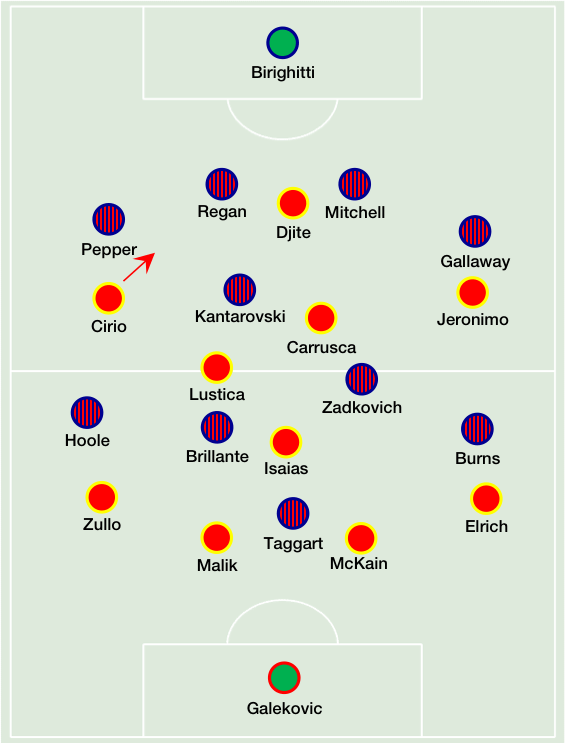 Perhaps Adelaide had identified Jacob Pepper at right-back as a weakness, although the defender made a terrific challenge to deny Cirio after the winger had got in behind on goal. Cirio’s unpredictable with his movement, and can dart down the outside towards the byline or cut infield towards the play. It was the latter that was the more effective ploy here, most obviously when he dribbled inside to start the move for the opening goal. It’s worth noting, too, that Jeronimo tended to stay wide on the right and receive passes to feet, similar to how the usual right-winger Fabio Ferriera operates on that flank – given Jeronimo’s natural style, you’d expect him to move closer to goal and play narrow on the wing, but by constantly keeping the width he helped stretch Newcastle’s defence. Almost immediately after Djite’s goal, Adelaide nearly doubled the lead by constructing a very similar move – Cirio carried it forward from the left, fed Jeronimo out on the right, who cut inside and tried to curl a shot towards the near post. It further illustrated Adelaide’s most dangerous pattern of play in the first half. Gombau seemed to have given his full-backs instructions to stick tight to their direct opponents – both Tarek Elrich and Michael Zullo kept very close to Nathan Burns and Andrew Hoole respectively, preventing them from turning on the ball and making it difficult for them to carry the ball forward. Burns, in particular, was nullified excellently by Elrich, who tracked his movement inside and continually forced him onto his weaker foot. Even though the Jets frequently built attacks down the flanks, with the full-backs linking up with the wingers ahead of them throughout the match, they had little penetration from this zone. A key factor of Newcastle’s recent success has been their ability to get midfield runners in beyond Adam Taggart, whose movement towards the channels invites Brillante, Zadkovich and Ben Kantarovski to dart forward into the space created. Brillante had a shot blocked in the 74th minute when he broke past the defensive line to receive a lay-off unmarked inside the box – they needed to create more of these opportunities. Unfortunately, as the game progressed it became somewhat tempered by fouls, and the opening ten minutes of the second half featured lots of niggly stoppages and dangerous slide tackles. It overshadowed Newcastle’s improved pressing (with Ruben Zadkovich now moving forward to help Brillante close down) and possession play, which improved after the interval and forced Adelaide backwards, creating a nice spell of pressure. The improvement probably changed Van Egmond’s mind about introducing James Brown as was mooted early in the second half, but he was surprisingly passive with his use of the bench afterwards. On the hour mark, Heskey came on for Hoole, pushing Taggart out to the left and switching Burns over to the right, but he didn’t make a second substitute until the 82nd minute, when both Craig Goodwin and Brown (finally) came on for Scott Gallaway and Burns respectively. Heskey, naturally, gave Newcastle an additional aerial threat, and they became noticeably more dangerous from corners afterwards, with Burns long lofted delivery towards the far post twice causing Adelaide trouble (particularly pertinent considering they conceded in a similar fashion in the reverse fixture). However, the most effective substitute was Awer Mabil, who came on as part of an enforced double change. The youngster twice drove past makeshift left-back Goodwin to lay up neat cutbacks for players in the penalty box – Cirio should have scored. Adelaide had the better chances throughout the match, and showed more variety in their attacking play than Newcastle – the use of Djite upfront gives them another dimension to the now well established short passing game, which still creates the bulk of their chances. Van Egmond could’ve probably been more bold with his use of the bench, but he was probably pleased with the way his side turned the momentum at the start of the second half, even if that was disrupted by the increasing physicality of the game.